Since the sun had decided to grace us with its presence for just about the first time in a few weeks, yesterday I took a break from trying to organize French wildlife in favour of trying to catch, photographically of course, some English wildlife. I took myself off to my favourite local location, Sandhouse Lane Nature Reserve. It’s so great because, more often than not, I’m the only one there. That is, I’m the only mammalian biped there. Such was the case yesterday, although I think my six-legged friends were equally pleased to see the sun because there was some pretty frenetic insect activity. 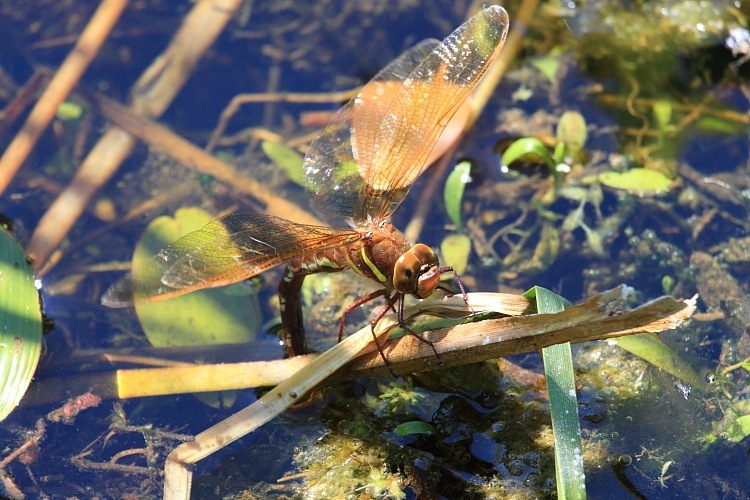 Over the pond, Brown Hawkers (Aeshna grandis) were the first positive sign I saw as two or three tirelessly patrolled above the water. They didn’t seem too fussy about what they’d chase in the hope of a meal, even drifting seeds which, of course, they rejected. Quite frequently times they seemed to chase each other, much of which I’m sure is territorial aggression, but I did begin to wonder if they would actually be cannibalistic. I tried fruitlessly to catch one in flight but, alas, they didn’t seem to go into a hover. So intent was I on watching them hunt, that I almost missed one ovipositing in the pond almost at my feet. Hmm, maybe they weren’t chasing each other to be cannibalistic after all? More action soon followed as a tandem pair of Ruddy Darters (Sympetrum sanguineum) positioned themselves perfectly on a leaf quite close to me. How generous of them. Sometimes standing still and waiting for the dragonflies to come to me seems to be more productive than going to them. In practice, of course, both techniques are required. 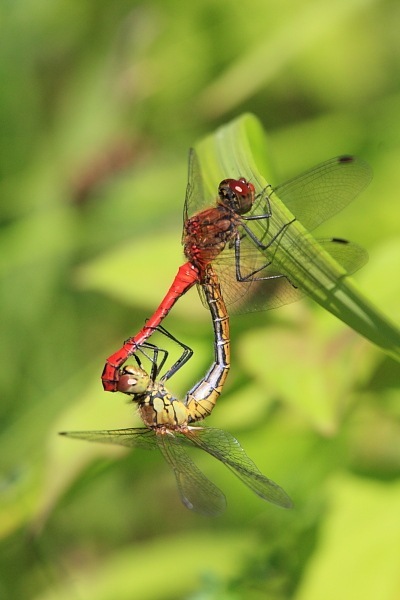 Clearly the sun really was working magic as the tandem pair adopted the copulation wheel formation. 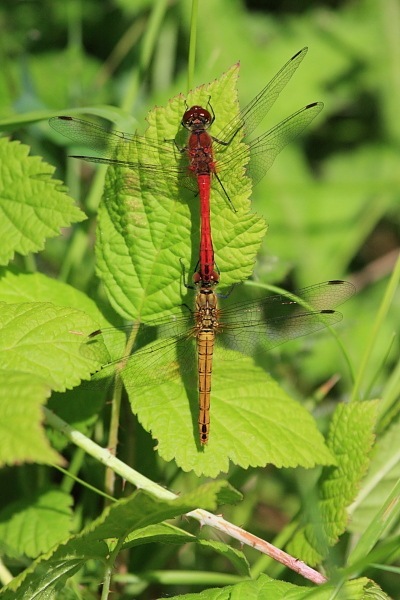 In good conditions, it is usual to see dragonflies and damselflies mating. I suspect that this is a feature of their precarious life as an adult; as soon as conditions turn favourable, there is a general rush to reproduce.